(Scarlet Wolfberry) is a Chinese native perennial shrub with slender stems growing up to 6.5-13 feet high if not pruned. From June to September, the shrub is decorated with pale violet, fragrant flowers. fruits will then appear till first frost and is rich in vitamins, trace elements, antioxidants, amino acids, and essential fatty acids. 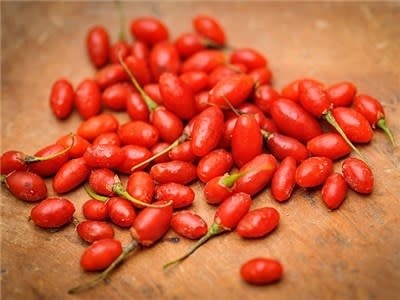 Traditionally, this super-fruit has been used to help improve eyesight, inhibit the synthesis of cholesterol, regulate the digestive system, to reduce inflammation, and is said to slow the aging process. Naturally drought tolerant, highly disease and insect resistant, and tolerates temps down to -18 F. The tender fruit appears in two years, and a mature plant can produce almost 7 lbs of berries under good conditions by the third year. Add the fruit to tonic, soups, rice or herbal tea. The tender shoots and leaves are used as a leaf vegetable and are cooked 15 minutes in soup. May interfere with blood thinners and other medications metabolized by the liver.